A nail biting finish for the VO65s and another class win for father-son duo on Night and Day – North Sails clients find success in the 2017 Fastnet Race. The Fastnet Race is among the most challenging offshore races in the world, and this year was no exception with a record 368 boats crossing the start line in Cowes. Corinthian and professional teams lined up off the Royal Yacht Squadron, following a course around The Lizard (the most westerly point of mainland Britain), through the Irish Sea to round Fastnet Rock, and back to Plymouth on the UK’s South coast. 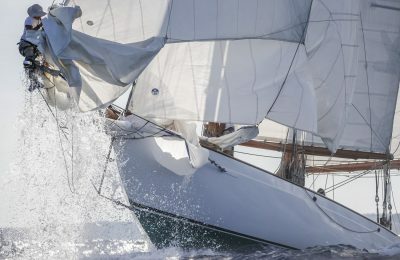 While conditions this year did not serve a record-breaking run, some 2700 sailors aboard everything from 30 footers to the 115 ft Nikata, took on the highs and lows of this 605 nm offshore race – starting with an upwind slog out of the Solent in a 15-20 knot Westerly. First to go were the multihulls including Tony Lawson’s MOD70 Team Concise, who rounded the needles at the furthest end of the Solent before most boats had entered their starting sequence! Team Concise finished the race in a remarkable 42 hours and 55 minutes, just as the fastest Monohulls were arriving at Fastnet Rock. The IRC classes followed which included defending double-handed champions Night and Day. The French father-son duo once again took the double handed win as well as winning IRC 4. Ron O’Hanley’s North-powered Cookson 50 Privateer took the top spot in IRC Z and narrowly missed the overall IRC win to Didier Gaudoux’s Lann Ael 2. Racing in IRC 1, Lann Ael 2 completed the race in a corrected time of 3 days, 23 hours, 55 mins and 27 seconds, giving them the overall IRC win. 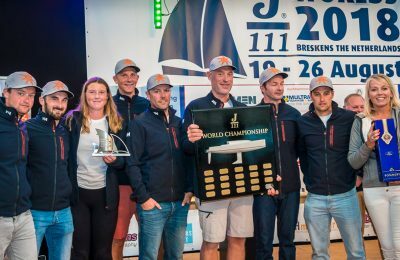 George David’s Rambler 88 took monohull line honors in 2 days 9 hours 34 mins and 21 seconds, which is over six hours faster than their 2015 time. The VO65s were the last to set off. With the Volvo Ocean Race start on the horizon, the Fastnet Race is part of their “Leg 0” – a final shakedown for these around-the-world sailors before taking on the trip of a lifetime. True to form, the competition was tight. After nearly three days of racing, the seven boats were separated by less than 40 minutes! The fight for the lead came right down to the wire between Team Mapfre and Dongfeng Race Team, who in the end benefitted from a crucial sail choice. 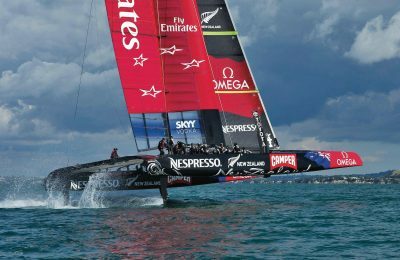 They had a smaller headsail up when a large gust came in, which powered them across the line just 56 seconds ahead! North Sails is proud to be the Official Sailmaker of the 2017-18 Volvo Ocean Race, in which all teams will race with 3Di sails. All but one of the VO65s competing in the 2017 Fastnet used North Sails 3Di mainsails from the previous race, boasting over 50,000 nautical miles logged. We estimate this is equal to about 12 years of use for the average sailor, offering superior performance with unprecedented durability. North Sails is proud to supply sails to competitors across the 2017 Fastnet fleet. Racing in the Fastnet is a right of passage for many sailors, just reaching the starting line is often an achievement in itself!